Thank you Damon Lindelof and Carlton Cuse for completely rocking my world once again with the sixth and final season premiere of “Lost”. I remain in a confused state of mind…and it has been two days. Why is the foot statue under water? Why is Desmond on the plane? Man in Black/Fake Locke is the smoke monster? Who are the hippies at the temple?! What the crap was that thing in the guitar case? What’s with Jacob and his lists? 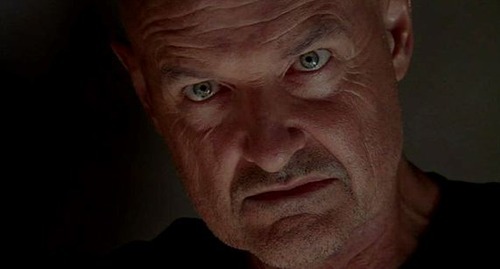 Since when did Terry O’Quinn have the ability to give a look so unbelievably bone chilling?! (see above picture) Sayid is alive now?! BOONE! CHARLIE! It was so awesome to see two of my favorite characters alive again. Ian Somerhalder plays an awesome creepy vampire on “The Vampire Diaries”, but he will always be Boone to me. I loved his interaction with Locke. Oh Charlie, I have missed you. I refuse to believe you are dead. I hope they stick around for more episodes. Jack and Kate’s little moment when she bumps into him coming out of the bathroom. If Jack and Kate don’t end up together, I will seriously flip. They’ve been the one true pair of “Lost” since the beginning. Hurley’s line of: “Excuse me, I carried that case across the ocean and like…through time…I want to know what that paper says.” So much win. Bottom line: “Lost” is back and better than ever.